Posted on 07. 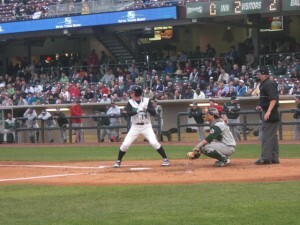 Jul, 2010 by Corey in All, Dayton Dragons Baseball, General Baseball. 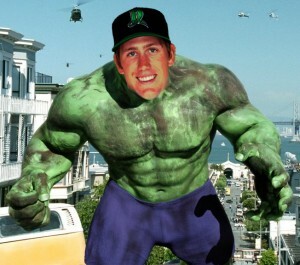 With the way that Garton has been playing on defense, it could be argued that he already has Hulk-like qualities. Twice within a one-week span, Garton has hit the right field wall, both times still running at full speed. The most important part, though, was that Garton held on to the ball and made both catches. The first collision with the wall happened on the road at Lake County. Not being very familiar with the ballpark, Garton did not see the wall coming, causing him to hit it at full speed. After only being down for a second to catch his breath, Garton bounced up and continued in the game without even thinking twice. “It would have hurt a lot more had I not held on to make the catch,” he said. 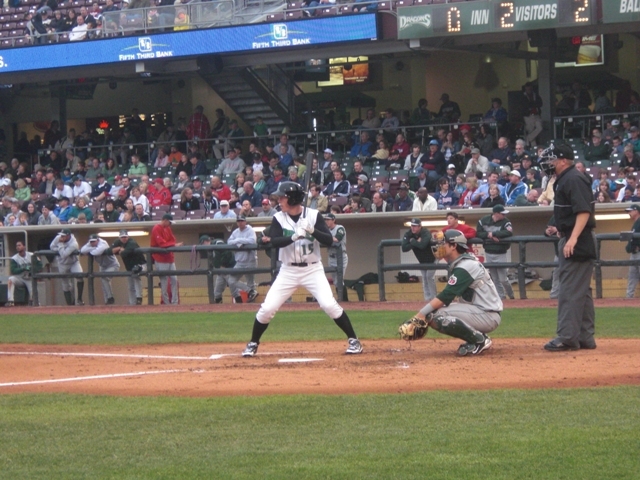 Two days later, back at home at Fifth Third Field, Garton said he knew the wall was coming quickly, but the thought of having to make the play allowed Garton to never flinch. Hitting the wall a second time hurt a bit more than the first time. Garton even remained on the ground for a few extra seconds. Dragons Athletic Trainer Tyler Steele sprinted out to right field to check on Garton. Upon arriving to Garton, Steele’s first question to him was, “Are you ok?” Garton quickly joked back with, “Are you tired from having to run all the way out here?” As the conversation went on, Steele checked on Garton’s head which head the wall pretty hard. “I told him not to worry, there isn’t much to hurt in my head,” Garton said. The aggressive defensive mind of Garton also carries over to the plate, something he feels may hurt him at times. He said he strikes out a lot due to his aggressiveness and he needs to find ways to be more patient at the plate.